Brian Altschuler started losing his hair when he was 28. Fearing that the hair loss made him appear 10 years older, Altschuler looked into toupees and weaves, but wasn’t thrilled with the prospect of shaving his head for a glued-on, fake-looking hairpiece. So last December, Altschuler had a $9,000 hair transplant. Now he feels like he’s regained his youthful edge. “We live in a society where people judge you by your appearance,” said Altschuler, now 33 and the manager of organizational development for Bethesda Healthcare Systems in Boynton Beach. Altschuler does work force training and development and often speaks to crowds of up to 400 people. 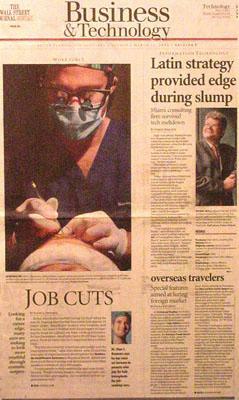 Like Altschuler, men in search of a competitive edge in business or the workplace are flocking to cosmetic surgeons to gain a more youthful appearance via plastic surgery, liposuction, Botox or chemical peels. Surgical procedures and recovery times have improved to the point where a man can leave work early on Friday, visit his cosmetic surgeon and arrive Monday morning sporting a new look. And television shows like Queer Eye for the Straight Guy reflect a society that is much more accepting of men who put effort into looking good. “There used to be a stigma associated with plastic surgery and vanity in men,” said Julio Gallo, a facial plastic surgeon in North Miami Beach. “I think men are realizing that it’s not a taboo area any more, and it helps them in not only their social life, but their professional career as well.” Gallo said that about a quarter of his patients today are men, up from about 10 percent a decade ago. The most common procedures he performs on men are nose jobs, eyelid lifts and face lifts. Gallo also does about 50 chin implants a year. In that procedure, a small wedge of solid silicone is inserted on top of the jaw bone through a 1-centimeter incision under the chin. “If a man has a weak chin, this distracts from an impression of authority,” he said. Another factor driving the trend: job insecurity. With the recent economic slump and downsizings, many men in their 40s and 50s have found themselves out of work. With younger men competing for what few jobs are available, older executives feel they need to gain an edge. Looking younger is considered an asset. “If someone looks washed out, then I don’t necessarily want to hire him,” said Thomas H. Shea, chief executive officer for the Florida/Caribbean Region of Right Management Consultants in Fort Lauderdale. “To have an equal chance, someone has to look vibrant — like they’re up to a challenge. That’s why plastic surgery is more culturally acceptable now.” Shea said that for job candidates, looking good is as important as keeping skills current. According to the New York-based American Society for Aesthetic Plastic Surgery, men had nearly 1.1 million cosmetic procedures last year (13 percent of the total). Cosmetic procedures for men increased 31 percent from 2002. The top five surgical procedures for men were liposuction, rhinoplasty, eyelid surgery, breast reduction and hair transplantation. Studies indicate that the perception of bias against older workers is widespread. According to a recent survey of executives conducted by Norwalk, Conn.-based ExecuNet, 82 percent of those surveyed said that age discrimination is a serious problem in today’s employment market, up from 78 percent three years ago. Martin Casal, a Miami-based sales representative for Toshiba America Inc., recently had rhinoplasty, commonly known as a “nose job.” “It was big and crooked and didn’t really match my face,” said Casal, 26. “I’m going into a field where I’m meeting people, and I felt that looking better would boost my confidence and self-esteem.” Casal paid $3,500 for the procedure. He now plans to go to a cosmetic dentist to get veneers to correct gaps between his teeth. He expects the increase in confidence to make him a better salesman. Bauman sees that kind of thinking often. “People need a competitive edge,” he said. And the edge of choice these days for more and more men comes on the underside of a scalpel. Robyn A. Friedman is a freelance writer. She can be reached at rafriedman@att.net.